This Toyota 2000GT from the sixties was probably one of the most overlooked cars at the Goodwood’s festival of speed, 2 weeks ago. Sure, it’s a very rare model, but they were so many incredible cars there. Yet there was something to notice: it wasn’t stock. Tires and brakes most obviously, were not from the sixties. 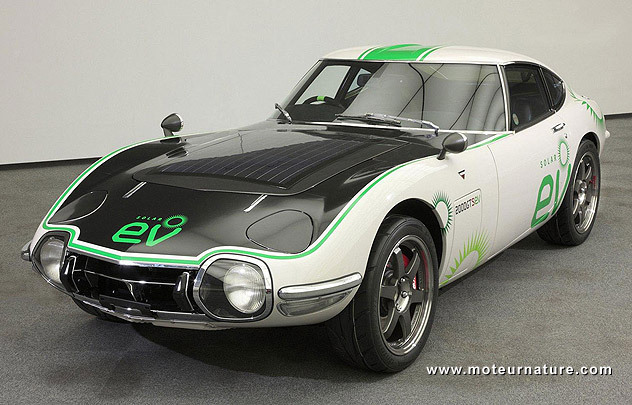 Then, they were solar cells on the hood and the large EV logos on the doors. Funny, someone had converted an icon from the sixties to an electric drive. But that wasn’t the job of a crazy individual. Well-paid Toyota’s engineers did it. No child-play here, according to Autocar, the engineers are making tests for an upcoming electric sports car. With something quite unusual for an electric car: a gearshift. We’ve been waiting for that. All of today’s EVs have poor performance and/or poor efficiency because of their single gear, and a gearbox would dramatically increase both. A choice of gears, with a manual gearshift like in a proper old-school sports car, would also make an electric car much more fun to drive. Though fine-tuning the drive will not be easy. An electric motor doesn’t have the flexibility of an ICE regarding the handling of a clutch, being easily engaged or disengaged. But Japanese engineers are the best in the world when it comes to smoothing mechanical functions. We bet this EV with a stick will be the car Toyota has recently teamed up with BMW to develop. Expect it around 2015.